A generation earlier this block of West 43rd Street was one of modest houses and horse stables. But now nearby 5th Avenue was lined with opulent mansions and 43rd Street was home to some of the most exclusive mens clubs in the city including the Racquet and Tennis Club and the Century Association. These high-end buildings, along with the growing theater district on nearby Times Square, required fire protection. But the millionaires quickly responded with a “not in our backyard” position. Isaac Townsend, the president of the Racquet and Tennis Club had sold the lot to the City and was, perhaps, seen as a defector among the club’s members. They joined with those of the Academy of Medicine and the Century Association in a heated meeting regarding the “nuisance” and “affliction to the neighborhood.” The anticipated ringing of bells at any hour of the day or night when a fire alarm was sounded was expected to ruin the quietude and sanctity of the clubs. Nevertheless, the City forged on with its plans. Architects Hoppin & Koen were commissioned to design the new structure. The firm had large shoes to fill. Since 1879 Napoleon LeBrun had been the official architect of the New York City Fire Department. 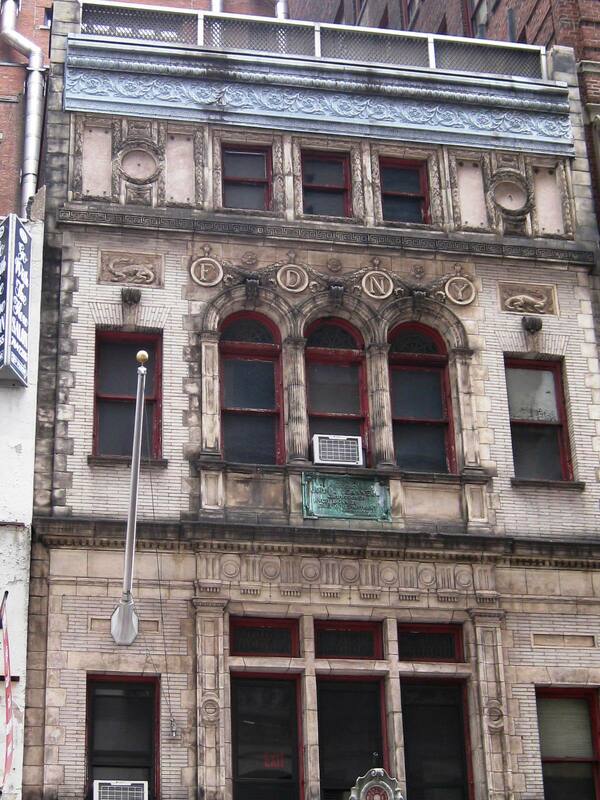 By the time he died in 1896, he had produced between 30 and 40 fire houses—each becoming successively more ornate. His Renaissance Revival and Italianate stations culminated in the 1896 EngineCompany No. 31 on Lafayette Street—a lavish Loire Valley chateau. Hoppin & Koen picked up where the architect left off and Fire Engine Company No. 65 closely resembled LeBrun’s work—perhaps most noticeably his 1894 Engine Company No. 14. Four stories tall, it was completed in 1898 at a cost of $24,000. The architects deftly melded the popular Beaux Arts with Renaissance styles to create a building appropriate to its high-end setting (and perhaps to appease its equally high-end neighbors). Above the limestone ground floor, a stone balcony stretched the width of the structure, supported by heavy, scrolled brackets and an ornamental cartouche that announced the address. The three upper floors, in buff-colored brick and terra cotta, were decorated with fire-breathing dragons—symbols of the fire-fighters’ purpose—and the encircled initials F D N Y connected by garlands and ribbons. Originally, marble insets graced the now-empty panels and circles of the top floor. One of the first major jobs for Engine Company No. 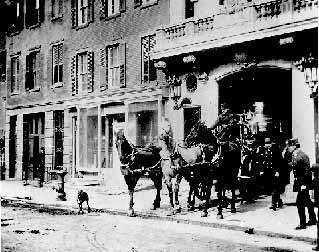 65 was the fire at the Windsor Hotel on Fifth Avenue on the afternoon of March 17, 1899 during the St. Patrick’s Day Parade. Around 3:00 a guest lit a cigar in a hallway and tossed the match, which set the curtains ablaze. Seeing what he had done, the man rushed out of the hotel. While the avenue outside was crowded with thousands of people, the fire rapidly spread throughout the building which stretched from 46th to 47th Street. The first alarm reached Engine Company No. 65 at 3:20 and by now guests and servants were already shinnying down safety ropes or, in a panic, throwing themselves from their windows to their deaths on the concrete. Two more alarms were sounded as the exclusive hotel burned like tinder. The fire fighters turned their attention to hosing down the surrounding buildings, including the mansion of Helen Gould at No. 579 5th Avenue and the Fellowes mansion at No. 570 5th Avenue which had began burning along an upper floor. By 4:00 the central section of the hotel had crumbled and at 4:20 the 46th Street wall collapsed. The original cornice and parapet have been replaced by a metal grill and a pressed-metal cornice. A year later, on April 17, the Company’s engine was speeding toward a two-alarm blaze at No. 358 West 48th Street. As the galloping horses attempted to cross 8th Avenue, they collided head-long into the 8th Avenue Street Car No. 1052 at 43rd Street, nearly knocking the car from the tracks and shattering the pole of the engine. One of the engine’s horses was slightly injured when it was caught between the other horses and the street car. Unwilling to let the accident derail their responsibility, the fire fighters unhitched two of the horses and proceeded to the scene of the fire. Twelve fire fighters were assigned to the station house. They worked around the clock, with three 24-hour leaves each month. In addition they were eligible for two 12-hour leaves to be taken separately from the full-day leaves. The firemen were permitted to go home for meals each day for a total of three hours every day. The time could be taken as a single 3-hour break, three hour breaks, or two hour-and- a-half breaks. Obviously, in addition to the extinguishing of fires, the men were responsible for the care and feeding of the engine horses. Another sensational fire broke out on March 4, 1906 when three car barns at the foot of West 42nd Street near the Hudson River caught fire. Before long the entire area from 41st to 44th Streets, 11th Avenue to the river, was threatened. The victim was never recovered. The firefighters had more than the car barns to worry about. Nearby was the was Consolidated Gas Company’s plant that extended the length of 42nd Street from 11th Avenue to the piers. Firemen kept the building hosed down and naptha, stored by hundreds of gallons was drawn off and stored remotely. The same procedures were followed at the gas plant on West 44th Street where sparks from the fire were falling. In the meantime, small explosions burst from within the car barns as cans of oil ignited. For an hour “The flames illuminated the entire west side water front as they leaped high into the air, and the sparks streamed in cascades for blocks across the city,” said The Times. The puppy was named Cappy and became the mascot of the fire house. When an alarm would sound, Cappy would jump onto the fire truck and ride to the scene with the fire fighters. The station was near the advertising district and since Cappy was so photogenic, the ad men sought him out as a model. Cappy’s last ride on the trucks was in 1942. By then the modern equipment was so fast it was difficult for him to keep his balance when the equipment took a corner. So he remained back at the station house where his bed was near the warm chimney. In 1949 Cappy began showing his age; then in April 1950 he began to shake and drink excessive amounts of water. The firemen took him to the veterinary hospital where he was diagnosed with uremia. On May 7 the bulletin board just inside the front door of Engine Company 65 told the news: “5-5-5-5. Our mascot. 5-7-50, 8:30 A.M.” Four 5’s was FDNY code for a departmental death. The following Thursday a funeral was held at Bide-a-Wee animal cemetery in Wantaugh, Long Island and the off-duty platoon of around 15 rugged firefighters attended the service for their beloved Dalmation. A fund was initiated to purchase a grave marker for Cappy. With only a few changes (the original cornice has been replaced by a pressed metal one and the marble panels at the fourth floor level are gone, for instance), Hoppin & Koen’s impressive 1898 fire house looks much as it did when the first 12 fire fighters moved in. Over the years several of Engine Company 65’s members have sacrificed their lives, including three who died in a fire at the Hotel Ritz on Park Avenue on August 1, 1932. The dragons on the façade represent the dangers they fought, and the laurel leaves that outline the windows on the floor above symbolize the glory that is due them.